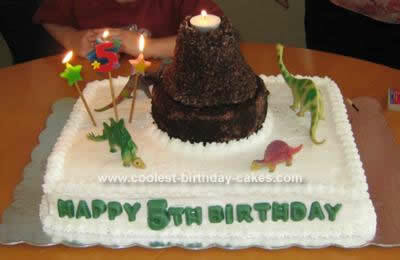 This Volcano and Dinosaurs Birthday Cake was for my son’s 5th birthday. I always challenge myself to come up with something new and fun every year, and he wanted dinosaurs – so I thought it would be fun to do a volcano as well. The bottom is a yellow sheet cake frosted with buttercream. There is a round chocolate cake on top that I frosted and covered with Oreo cookie crumbs and filled with chocolate buttercream. The volcano is made with Cocoa Krispies- I made it according to rice crispie treat recipe and packed it together with my hands into a cone shape. I rolled it on the counter-top to smooth out the sides, then made a hollow space at the top to put a tea-light in. The letters on the side are done with candy melts in a letter/number mold. It was simple and fun and all the kids thought it was the coolest cake ever!